This condo tower, offering homes ranging from 620 to 1010 square feet, is located along one of the most powerful streets in the city, where your neighbors include The Washington Post, The Walter E. Washington Convention Center, and The White House. But it doesn’t have to always be work. At home, you can enjoy generous living quarters, a pool table, an on-site fitness center, and a rooftop deck for moments of relaxation while, 14 stories below, busy commuters make their way home for the evening. This premier location also puts you blocks away from several Metro stations (including McPherson Square, Metro Center, and Gallery Place-Chinatown), so when you’re ready to go out on the town – either nearby or across the city – you’ll have easy ways to get where you want to go. But you won’t want to miss out on some of the exciting places in the blocks around you, including Belgian bistro Brasserie Beck, Buredo (for the highly coveted sushi burrito), the National Museum of Women in the Arts, and the high-end shopping and dining experience at CityCenterDC. 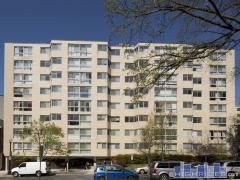 Have any comments or questions about 1150 K Street? Ask your question and/or share your thoughts about this Building.